Moo and Brew Fest…What More Could a Beer-Drinking Carnivore Want?? 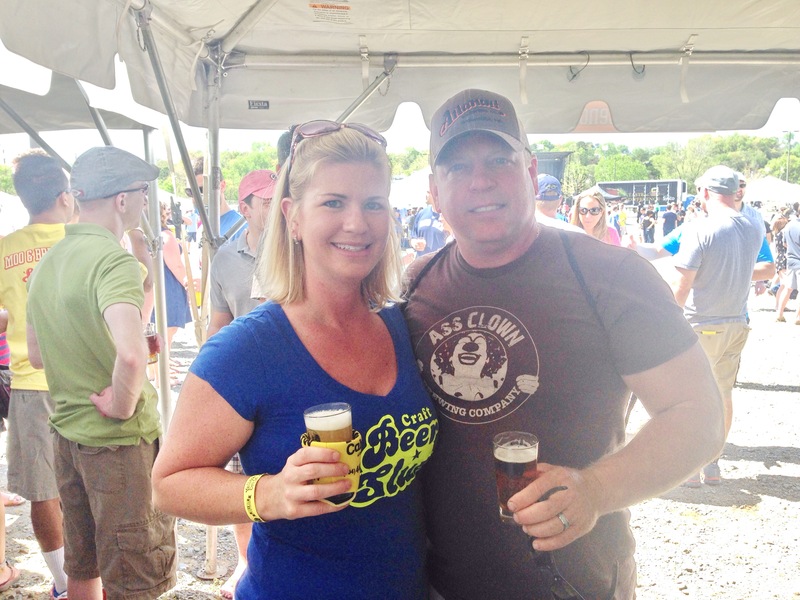 Creative Loafing’s First Moo and Brew Fest was on April 11 at NC Music Factory in Charlotte, NC. The event featured a VIP tasting from 12-2 and a General Tasting from 2-6 where attendees could sample unlimited tastes of beer from over 20 breweries and bottle shops and purchase slider samples, which ranged in price from $2-$3. Restaurants competed for the coveted title of Creative Loafing Best Burger Charlotte. Attendees were given a ticket to vote for their favorite burger. Each representative restaurant prepared two of their best burgers for a mass of hungry attendees. The burgers selection included many creative concoctions, including burgers made with bison, livermush, pulled pork, and brisket. At the end of the day, my vote went to Bang Bang Burgers and hubby voted for Heist Brewery–we wanted to give our favorite two burgers a shot at the win. Heist Brewery served their Burger Burger Burger slider, a meaty treat comprised of brisket, porterhouse tail, and chuck, topped with jalapeno bacon jam, herbed goat cheese, roasted tomatoes and pork belly brioche. Hungry yet?? If so, get your taste buds ready for Bang Bang’s burger– a juicy pimento cheese burger served with a DELICIOUS side of sweet potato chips topped with a magical maple drizzle. At the end of the day, Bang Bang Burgers was the champion. The selection of beer was adequate and there was enough beer to last through the entire event. I was excited to try a few new breweries I had not yet sampled, such as Sugar Creek Brewery, The Barking Duck Brewing Company, and Sycamore Brewing. There were several bottle shops that had tents, where they poured a variety of beers ranging from Foothills Sexual Chocolate to Bell’s HopSlam. One of the friendliest bottle shop vendors was Robert Burrage of Lil’ Robert’s Place in Concord. I had to snap a pic with him! Notice behind us, he has his own sticker made in his likeness. What a great guy! Just before I left for the day, I found a new, fun line of wine spritzers from Barefoot called Refresh. These semi-bubbly beverages are available in several flavors and are perfect for an afternoon relaxing on the porch. 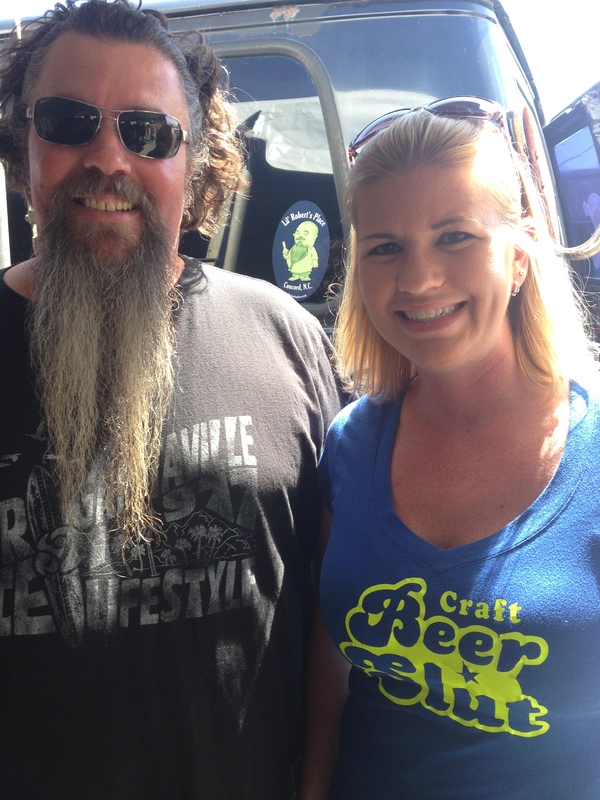 All in all, the Moo and Brew Fest was a fun event with lots of great vendors and beer. I did find the tickets a bit pricey at $50 each, especially when the sliders had to be purchased separately.